Calling all Afishianados! On April 27, The Painted Turtle, a camp for children with serious medical conditions co-founded by Paul Newman and Page Adler will host its Inaugural Fishing Derby. Community members are invited to catch the spirit of camp as well as a few fish! 100% of every dollar raised by participants will help send children with serious medical to camp. Ticket holders will enjoy a fishing spot on our private 4 acre lake and a delicious lunch BBQ, all while supporting The Painted Turtle! Tickets start at $120. The Painted Turtle is a member of the Serious Fun Children’s Network, an international family of camps founded by Paul Newman. The Painted Turtle is the only camp of its kind in California, serving children across the state with a variety of serious illnesses. It is located in the Angeles National Forest, nestled between the Antelope and Santa Clarita valleys. Through 8 week-long Summer Camp Sessions and 11 Family Weekend programs, The Painted Turtle provides life-changing experiences for 2,500 children, ages 7-16, with serious medical conditions and their families. In addition, The Painted Turtle reaches another 2,000 children each year in hospitals across California through its hospital outreach program, The Painted Turtle Outpost. With the on-site support of some of California’s top pediatric medical professionals, The Painted Turtle’s adaptive programming makes it possible for children with serious medical conditions to enjoy traditional summer camp activities such as fishing, boating, horseback riding, archery, high ropes, arts and crafts, woodshop, and much more. Through these programs campers gain self-confidence and independence and form a community of friends with other children who face similar medical challenges. Each session is medical-condition specific. Throughout the year The Painted Turtle welcomes children with over 30 different illnesses. Medical conditions served at The Painted Turtle this year include: cerebral palsy, spina bifida, kidney disease and transplant, liver disease and transplant, primary immunodeficiency diseases, rheumatic diseases, skeletal dysplasia (dwarfism), hemophilia, inflammatory bowel diseases, neuromuscular disorders, genetic and metabolic conditions, and many more. 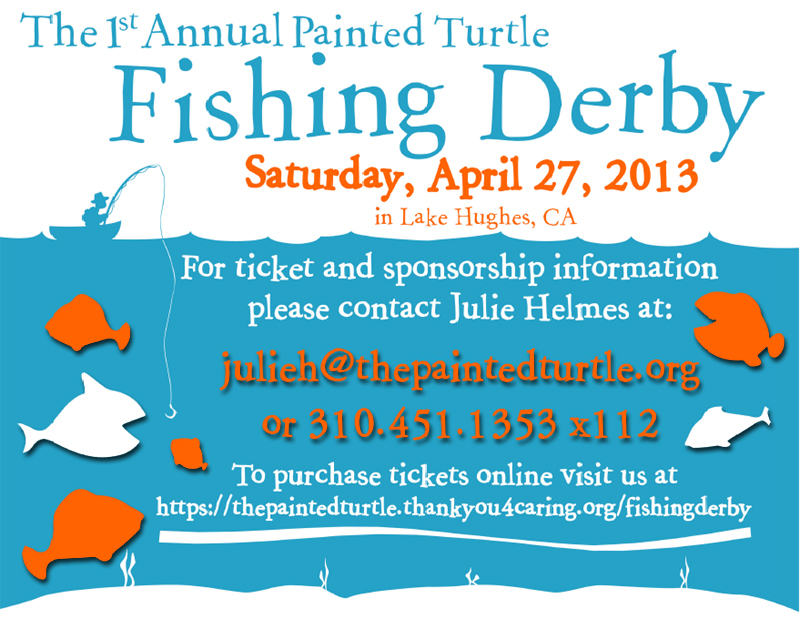 To learn more about this special fishing event please contact Julie Helmes at 310-451-1353 x112 or visit our website at vwww.thepaintedturtle.org. Bass, bluegill, catfish and trout await. One of Paul Newman’s SeriousFun Camps, The Painted Turtle’s mission is to provide a year-round, life-changing environment and authentic camp experience for children with chronic and life-threatening illnesses. The Painted Turtle supports children’s medical needs, inspires them to reach beyond their illnesses, and provides care, education and respite for their families. All campers and families attend free of charge. Since 1988, over 337,500 people have been served through these camps founded by Paul Newman, including more than 152,000 children from 50 countries. The Painted Turtle is an independent not-for-profit organization dependent on the generosity of private donors to serve all children free of charge. Learn more at www.thepaintedturtle.org.